A brand new precision hoe drill from Flexi-Coil is delivering seeding accuracy and peace of mind to a New South Wales grower after his previous seeding bar broke in half. The NSW grower, John Gawne grows wheat, barley and canola on 1,618 hectares on his property Barraclear in Grong Grong, near WaggaWagga. In addition to managing his own property, John also does contract seeding up to 60km away; his hoe drill therefore, needed to be easily transportable as well as strong. John was previously using an expensive seeding bar from another manufacturer and it broke in half. He chose the new Flexi-Coil PD 5700 precision hoe drill largely for its quality, with the amount of steel in the machine and the quality of the workmanship providing him the assurance that it will not crack or break. In addition to its durability, the hoe’s size was also a big selling point for John as he was able to easily and legally tow it up the highway folded up neatly, and then unfold it to the full 18.3-metre working width. Other machines he used had a height issue especially when going under electricity lines in towns. Since the PD 5700 is only a little over five metres high, there is no trouble. John grows wheat on 800 hectares, canola on 400 hectares and barley on 240 hectares. His yield depends on rainfall and he is able to sow into moisture most of the time. With undulating terrain and wet loamy soil, John seeds wheat and barley to 40mm and canola to 5mm, using 100 tonnes of sulphur phosphate and 60 tonnes of urea per year, applied at seeding using his three-bin Flexi-Coil 3850 air cart. John explains that accuracy of seeding is critical for greater productivity, which he is able to accomplish with the new Flexi-Coil PD 5700 precision hoe drill. John considered two competitor model machines before settling on the PD 5700 for qualities such as lasting durability as well as tidy folding, which was an important factor due to the amount of travelling he did with his machine. To date John has sown approximately 600 hectares with the new drill and says he can already see that it will deliver results according to expectations. Easy set-up and user-friendly operation are some of the benefits of the PD 5700. The onboard computer controls were a bit daunting in the beginning for John but the ease of use helped him familiarise himself with the operation. 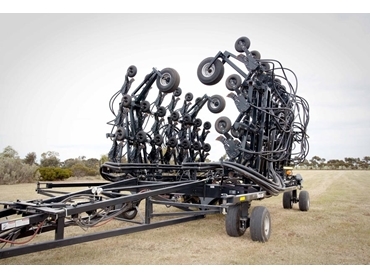 A few minor issues with setting up the PD 5700 and 3850 air cart combination were easily resolved with the help of his local Flexi-Coil dealership, Norwood Farm Machinery.